The James R. Ryan Family Foundation selected Lily Soule to receive its annual scholarship for middle school students. “This scholarship is a huge blessing to me and my family and greatly eases the financial burden of obtaining a college education,” commented Soule. Miss Soule plans to study engineering. The James R. Ryan Family Foundation Middle School Scholarship is offered to a Gull Lake Middle School eighth grader who has demonstrated potential for academic success in preparation for college. This annual $8,000 scholarship is renewable over a four-year period, up to a maximum of $32,000. At this time, there are three James R. Ryan Family Foundation Scholarship recipients attending college, and five additional recipients in high school. Dr. James R. Ryan (1936–2006), a highly respected and nationally recognized orthopedic oncology expert, spent the last several years of his career practicing medicine in the Gull Lake area with his nephew, Dr. Thomas Ryan, at Kalamazoo Orthopedic Clinic. Dr. James Ryan demonstrated a dedication to education throughout his entire life, and his generous gift will assist future students in their effort to realize their academic potential. The Gull Lake Community Schools Foundation is pleased to administer this wonderful scholarship. Thank you to the Ryan family for their generosity and continued support of Gull Lake students. 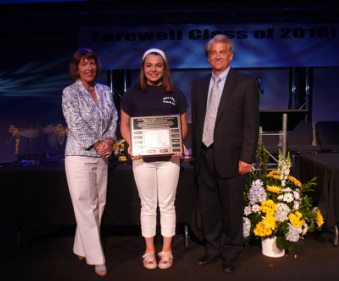 Photo caption: Lily Soule, with Dr. and Mrs.Tom Ryan after being announced as the 2012 recipient of the James R. Ryan Family Foundation Middle School Scholarship during the eighth-grade Recognition Night in June 2012.